This item appeared in the May 31, 1911 Indianapolis Star. 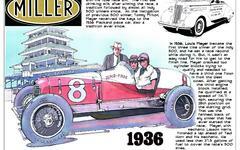 It includes a couple of images of Bob Burman being crowned "Speed King" at the Indianapolis Motor Speedway at 9 a.m. on the morning of the first Indianapolis 500, May 30, 1911. The award was in recognition of his land speed record at Daytona Beach and followed his record runs at the Speedway on May 29, 1911. The man pictured crowning Burman is long-time AAA official and the event referee at the first Indianapolis 500, Arthur Rayner (A.R.) Pardington. Pardington was a central figure in the establishment of the Vanderbilt Cup road race and the Long Island Motor Parkway in New York.